This story begins with a personality who is no stranger to our lifestyle and cruising community. Reuben Trane has been kicking around boats his entire life, and his experience developing new boat designs goes back decades. Reuben was behind a line of pocket sailboats, the Mud Hen, Bay Hen, and Peep Hen, in the ’80s. Then, working with designer Jay Benford, he moved on to the Florida Bay Coasters, a collection of a dozen or so small steel freighters that continue to frequent our coastal waterways with palatial accommodations. Reuben next crafted the Krogen Express 49 with Kurt Krogen, and today’s version, the Krogen Express 52, is one graceful and lovely cruising boat that can fulfill anyone’s dreams. Never satisfied, Reuben moved to the Great Harbour 37 with Mirage Manufacturing’s Ken Fickett. I saw a raft-up last weekend of three Great Harbours, and they have proved to be popular liveaboard cruisers. All of Reuben’s boat projects share one thing: They are a little different from most boats. So it was no surprise to get Reuben’s take on his latest project, the Island Pilot 395, a design even more different than his previous efforts. The boat is a competent cruising vessel, but one that cruises at 25 knots. I saw his first two-stateroom model at Trawler Fest Mystic, and we decided to spend a couple of days on his new fast trawler after the event. The differences begin with the profile of the boat. Reuben’s explanation for its appearance is that, in collaboration with naval architect George Petrie, he took elements of pilot boats, lifeboats, and other working boats. Reuben’s design wraps these elements around an existing Her Shine hull shape that the Taiwan builder had from a previous venture. Moving the hull mold to a new facility in Zhuhai, China, provided the starting point for the new Island Pilot 395. Amazingly, the existing Her Shine hull mold allowed Reuben to go from early design concept to a completed, show-ready boat in just one year, no mean feat in this industry. And it was on the mark. He sold 13 boats the first year. That is a good measure of the boat’s acceptance. An example of the faster generation of cruising motorboats, the Island Pilot is quick, quiet, and comfortable, with all the amenities of a traditional trawler, yet enough differences to make a statement. I looked forward to being aboard. The day after our Trawler Fest event ended, the Mystic bridge opened to allow several trawlers to journey out of the seaport and into Long Island Sound. One of them was the Island Pilot crewed by Reuben and his wife, Cheryl. I stepped aboard the boat at Seaport Marina after a couple of prospective buyers had gone on a sea trial earlier that morning. I must admit from the outset that I did not expect to like this boat as much as I do. It is a bit different, but many of Reuben’s touches make a ton of sense. We’ll get to that soon enough. Reuben has spent a lifetime in New England, so it was natural that our destination as we left Mystic, Connecticut, on our little cruise would be several of Reuben’s old haunts: fabled Nantucket, Cuttyhunk, and Martha’s Vineyard, all famed for attracting prominent people. The charm and beauty of these islands has remained untarnished over time. But it was the busy summer season, and tourism was definitely in full swing. Visitors came from all over the East Coast. The splendor of traveling at 25 knots on a calm Long Island Sound (burning 29gph) meant we got to Nantucket in just five hours, sweeping around the back end of the Elizabeth Islands in Vineyard Sound. That alone should send a message to old cronies who insist displacement trawlers are the Holy Grail of Trawlerdom. Having a good weather window allowed us to maximize the opportunity of a good passage on flat water. During the passage, once I left the compact flybridge, I measured 77–79dBA in the boat, with the noise mostly coming from the water rushing past the hull, rather than from the engines. Which brings us to my first observation. 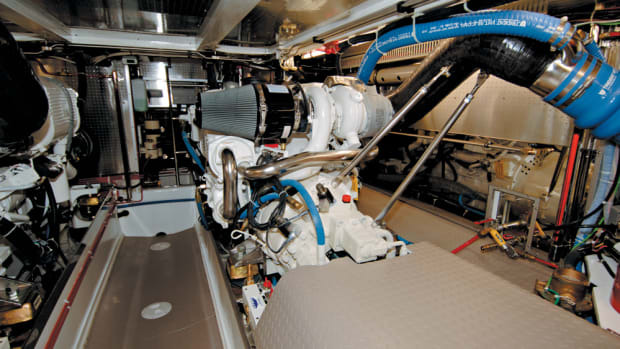 On the Island Pilot 395, Reuben chose two Volvo Penta D6-350/DP power plants with Duoprop drives, located in the stern of the boat. These units, with steerable outdrives, allow this boat to handle like a speedboat. Reuben spun the boat so quickly at 25 knots that the crew on a large racing sailboat stopped what they were doing to watch the almost military-looking boat make donuts in the water. It is an impressive steering capability. Nantucket was once the whaling capital of the world, first sighted by Norsemen in the 11th century. The island is a seasonal home for many, and the sophistication of its permanent residents is somewhat at odds with tourism. All homes have cedar shakes and follow a strict building code to maintain the island’s historic character. With a full-time population of just 10,000, the island has 82 miles of beaches. Nantucket is a town, a county, and an island. And, in many ways, its own culture. We docked for the night in a slip at the home of one of Reuben’s family friends, and during our stay, I met several seventh-generation residents. We walked into town on cobblestone streets and soon found shops and restaurants, and streets filled with SUVs that had come over by ferry from Cape Cod. On the recommendation of friends, we chose to eat at the Straight Wharf Restaurant, a wise choice indeed. OK, so this is a boat tour, but give me some latitude here. Have you ever had smoked bluefish pâté served with Parmesan toast? Didn’t think so. This restaurant, with Scott Fraley as general manager and chefs Gabriel Frasca and Amanda Lydon, opened earlier this year and proved to be an exquisite experience. The company, the view of the harbor, Rose (our lovely server), and the menu—it was all simply delightful. It was a fine way to wind down our passage from Mystic. When Rose brought us a handwritten bill, I savored this classy and personal touch with the last of our wine. To everyone at Straight Wharf Restaurant, I wish you lots of good fortune in your careers. Your passion was clear that night. The next morning I got the chance to really go through the boat. At rest, it is 6 feet from the bow to the water, and the expansive foredeck is almost 17 feet from bow to the forward windows, which Reuben copied right off a working pilot boat. The extremely clean deck layout of the Island Pilot is most evident on the foredeck, with nothing to snare toes or cause one to trip. Were this a genuine pilot boat, however, the stanchion handrails would be replaced by a tall single handrail running down the center of the foredeck. Two steps down from the foredeck brings us to the boat’s wide side decks, which have stanchions that are 24 inches high on the foredeck but follow the lines of the profile to become a comfortable 37 inches high in and around the aft cockpit. As I walked around the boat, I noticed that none of the windows opens, so the threat of leaks is minimal. Again, this boat’s emulation of a pilot/lifeboat translates to a boat that, once under way, is all business and is not about smelling the roses while making leisurely passages. In some ways, the boat strikes me as a nautical spaceship, with exterior design and equipment components selected to get the crew there and on station swiftly and safely. The lack of exterior handholds supports that mission statement. There is no reason to be lounging outside while running at speed. The quality of Her Shine’s stainless-steel work is evidenced everywhere, and I could not find a weld that was rough or uneven. The Chinese workers are learning well from their Taiwan supervision. The 28-inch height difference between the foredeck and side deck simplifies getting on and off the boat in a variety of dock situations. Also, as one finds on a pilot boat, the deckhouse slants inward from the deck, so even wide-shouldered crew will feel comfortable moving around the boat. All in all, it is a very clean and unrestricted exterior. It quickly grew on me. The cockpit of the Island Pilot is open and measures roughly 7 feet long by 12 feet wide. Not a place to sit while under way, perhaps, but a perfect place to be once one arrives at the next destination. Where many boats in our niche have an almost womb-like cockpit, the Island Pilot takes a different tack altogether. Once the hook is securely set, it’s just you and the fish. It would be lovely in the Bahamas, close to the natural surroundings that draw us to cruising in the first place. Three large hatches open for access to the engine room. With the three hatches open, the cockpit is transformed into an engine room with unlimited headroom and access. A built-in toolbox sits between the two Volvos, and I found access to all systems superb. The three-step ladder down to the engine room should have flat rungs, not those nasty round bars that are so unfriendly to bare feet. Watching Reuben inspect and replace an impeller, I marveled at the openness of this cockpit location of the engines. A nice breeze blew past, assuring me that this was not the typical hot engine room space. The unusual use of outdrives allows such a setup, and I believe there is much to recommend it on a cruising boat, while taking into account the maintenance issues already mentioned. A 7.5kW Westerbeke generator sits on a shelf just forward of the two engines. One steps down into the saloon, a full 10 inches. And given how tall Reuben is, it was no surprise that there is a minimum of 6 feet 6 inches of headroom throughout the boat. The Island Pilot saloon is compact, measuring 6 feet 6 inches long and 9 feet 6 inches wide. The starboard L-shaped settee is long enough for stretching out, with a folding-leaf table that electrically raises and lowers to fit the situation. There are useful storage drawers under the settee, which pulls out for additional berthing. Across on the port side is a 3-foot-wide seat with a cabinet and electrical panel aft of the seat. A television is housed under the seat, which swings up for viewing. The two-stateroom version of the Island Pilot is galley up, a compact but workable area that includes two refrigerator drawers (made by Vitrifrigo), a Princess three-burner electric stove, a Sharp convection oven/microwave, a single sink, and storage drawers and lockers. Across from the galley, and just forward of the saloon settee, is the inside helm station. Two adjustable helm chairs are mounted atop a storage structure, and each adjusts independently fore and aft. 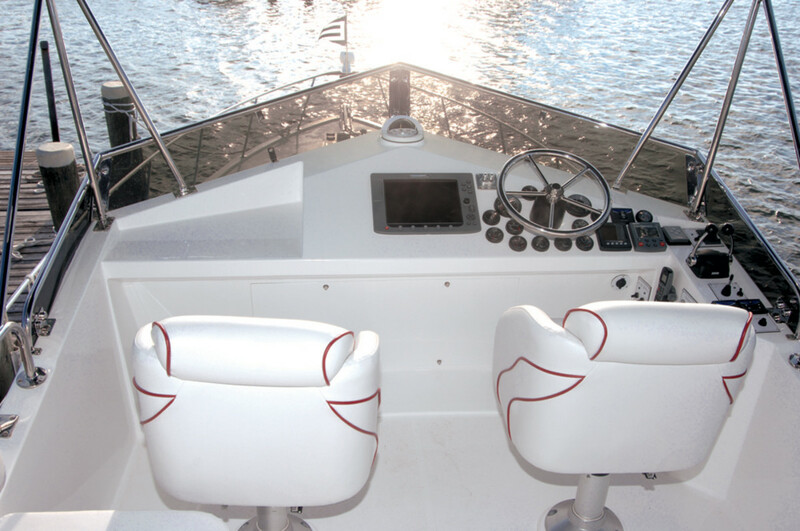 The helm console on this boat includes a full Raymarine E-series electronics package and engine instrumentation for the Volvo D6 engines. Included in the engine package are gauges that show outdrive vertical angle indicators, as the outdrives can be moved off vertical 5 degrees forward and 6 degrees back. Even with this level of adjustment, however, trim tabs are fitted to each boat. Another big surprise was under the saloon. Normally a place for engine installations, this space is a virtual basement, or super lazarette, that offers outstanding utility. A washer and dryer fit easily, as do bins of parts, provisions, liquids, wine, tools, and auxiliary systems. Measuring 42 inches deep beneath the deck, with the gas-strutted hatch open, access is outstanding. I first saw this kind of design feature on Steve Dashew’s Wind Horse, and I find it remarkably useful. guest accommodation, perfect for temporary use. Moving forward toward the master stateroom, there are bookshelves and double freezer drawers in the companionway. Typical of Trane’s untypical thinking, what first appears as limited storage is actually the opposite. It is just not traditional storage. The master stateroom is in the bow, with a centerline queen surrounded by two hanging lockers, drawers, shelves, opening ports, and an overhead hatch. With its en-suite head, it is perhaps the most traditional space on the entire boat. We left Nantucket with a missing impeller blade on the starboard engine. We planned to keep an eye on it, and George Petrie would bring a replacement impeller when he came to pick me up on the mainland. Reuben had discussed the situation with Volvo; company representatives had assured him it was fine but said he should keep an eye on the engine’s coolant temperature. It was a bit rough as we made the hour-and-a-half trip to Oak Bluffs on Martha’s Vineyard, but slowing down to 19 knots did the trick. Once we arrived on the island, we settled down and enjoyed the lunch we had purchased earlier from Provisions, an eatery across from the Straight Wharf Restaurant. The well-known Provisions sandwich called “Terrific Turkey” is a huge sandwich of turkey breast, stuffing, and cranberry sauce on Portuguese bread. Yum! I initially found Martha’s Vineyard crowded and busy compared to Nantucket, but a car ride around the island with vacationing friends brought us to Edgartown, a much less touristy place than Oak Bluffs. I saw the sights and played tourist the rest of the day. The following morning I was dropped off in Marion, Massachusetts, after we passed through Woods Hole and headed to the mainland. George Petrie greeted us, and he was kind enough to drive me back to Mystic so that I could pick up my car and make it home after a successful Trawler Fest event and another pleasurable boat trip. To simplify the boatbuilding process, Reuben includes just about everything a couple would want on the boat, from full electronics and entertainment system to dinghy and outboard. For a base price of under $450,000 for either single- or two-stateroom versions, the Island Pilot comes complete. I found Reuben Trane’s latest project a work in progress, as he mentioned several new changes he planned on future boats. He is clearly headed in a direction that people find appealing, and his boats, built under the experienced supervision of Her Shine Marine, are well done and nicely finished. The Island Pilot is an interesting cruising boat that will appeal to those who want a capable boat that can run at speed. The use of outdrives is decidedly nontraditional for a trawler of any kind, but it is a perfect illustration of how our niche has grown. 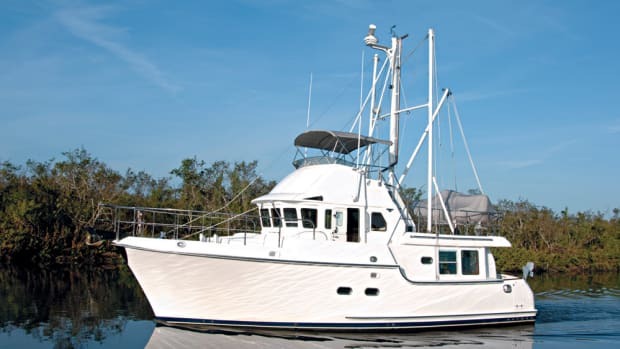 Reuben’s Florida Bay Coaster may have been the example of what many people think of as a trawler, but the Island Pilot 395 is closer to the mark for a great many people. Thanks, Reuben and Cheryl, for a fun trip and a great time aboard your latest creation.